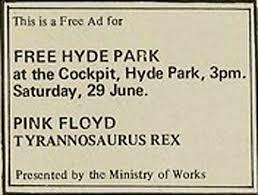 Pink Floyd news :: Brain Damage - Hyde Park Free Concerts - were you there? Hyde Park Free Concerts - were you there? BD reader Greg Taylor, long-time fan of the band and lucky enough to have witnessed several early concerts including shows with Syd Barrett, is seeking any recollections, however small, from any of the early Hyde Park Free Concerts. Greg wants to start with the first show in 1968 with anyone connected with the event as a fan of Pink Floyd or any other artists who performed. The early creative involvement of Blackhill Enterprises was key to the early shows so if you have any scraps of information on any of the people involved in hosting the event it would be most welcome. Greg is interested in doing a feature on Hyde Park ’68 – the whole concert and memories of subsequent ones too with peoples individual experiences, what they did there and who they met. Vivid details, however trivial will help create a sense of place and time for those pivotal events in rock history.